هدف این پژوهش، بررسی سازه‌های مؤثر بر تمایل باغداران شهرستان نطنز به بیمة محصول انار است. مطالعه از طریق روش پیمایش و با استفاده از شیوة نمونه‌گیری تصادفی طبقه‌بندی‌شده انجام گرفت. حجم نمونه با استفاده از فرمول کوکران 250 نفر برآورد شد که به کمک پرسش‌نامه، اطلاعات لازم جمع‌آوری شد. روایی ابزار سنجش از طریق آزمون آلفای کرونباخ، ارزیابی شد که میانگین مقدار ضریب آلفا در حدود 80 درصد به‌دست آمد. یافته‌های پژوهش نشان داد که تمایل انارکاران به بیمة محصولات با سن، سابقة فعالیت باغداری، آگاهی از بیمه، نگرش مثبت‌ به حق بیمه، ریسک‌پذیری، مشارکت اجتماعی، استفاده از منابع اطلاعاتی در رابطه با بیمه، درآمد سالانه، عملکرد و مساحت باغ، رابطه‌ای مستقیم دارد. همچنین آن دسته از انارکارانی که شغل دوم آن‌ها کشاورزی است، در مقایسه با گروهی که شغل اصلی آن‌ها کشاورزی بوده، تمایل بیشتری به بیمة محصول انار داشته‌اند. از طرفی تمایل باغداران انارکاری که بدهی داشته‌اند، در مقایسه با گروهی که بدهی نداشته‌اند، نسبت به بیمة محصول انار بیشتر بوده است. بهره‌مندی از منابع اطلاعاتی به‌منظور ارتقاء آگاهی عمومی نسبت به بیمه، ارائة خدمات حمایتی به انارکاران خرده‌پا به‌منظور ترغیب ایشان، تقسیط حق بیمة انارکاران با درآمد کمتر، بخشی از پیشنهاد‌های مطرح‌شده در این مطالعه در راستای افزایش تمایل انارکاران به بیمة محصول انار است. The aim of this study is to investigate factors affecting pomegranate growers' tendency toward agricultural insurance in Natanz County. Sample size was 250 that were selected by Kucran formula collected by questionnaire. Questionnaire reliability was examined by Cronbach's Alpha method about 80 percent. Findings revealed that willingness to insurance has direct relation with age, background in orchard production, number of household members, awareness toward insurance, positive attitude about insurance, risk prone, social participator, use of information resources in relation to insurance, annual income, production amount, total area of orchard. Moreover, those pomegranate growers that agricultural production was their second job, in compare to those who agricultural production was their main job, had more tendency toward insurance. Besides, those who got into debt in compare to those who did not get into debt had more tendency toward insurance. 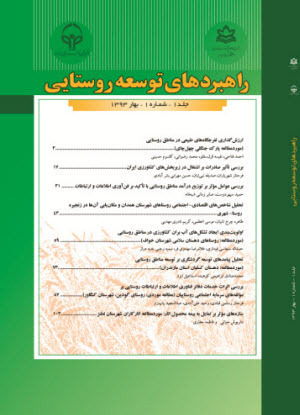 Using information resources to enhance pomegranate growers' awareness toward insurance, delivering supportive services for small holder pomegranate growers, and installment of insurance amount for those who have less earned income, are some part of those recommendations which have been presented in this study in order to enhance tendency toward agricultural insurance. سرمد ز.، بازرگان ع. و حجازی ا (1379) روش‌های تحقیق در علوم رفتاری. تهران، ایران. فرجی ا. و میر­دامادی م (1385) بررسی نقش ترویج در پذیرش بیمة محصول سیب توسط باغداران شهرستان دماوند. علوم کشاورزی. 3: 499-489. عین­اللهی احمدآبادی م (1387) عوامل مؤثر بر پذیرش بیمة گندم‌کاران استان زنجان مطالعه موردی شهرستان خدابنده. اقتصادکشاورزی و توسعه. 63: 70-51. کرباسی ع. و کامبوزیا ن (1382) بررسی عوامل مؤثر بر تقاضای بیمة محصولات کشاورزی استان سیستان و بلوچستان. اقتصادکشاورزی و توسعه. 41 و 42: 184-167. Fafchamps M (2002) Insurance market efficiency and crop choices in pakistan. Development Economics. 67: 419–د453 Available at www.elsevier.com/locate/econbase )Last access: 5 February 2011). Goodwin B. K (1993) An empirical analysis of the demand for multiple peril crop insurance. American Journal of Agricultural Economics. 4:425-434. Mahul O. and Wright B. D (2003) Designing optimal crop revenue insurance. American Agricultural Economics. 3: 580–589. Mojarradi G. R., Zamani G. H. and Zarafshani K (2008) Analysis of factors influencing farmers' attitude toward private crop insurer using Path Analysis. American – Eurasian Agriculture & Environmental Sciences. 1: 100-105. Nelson C. H. and Loehman E. T (1987) Further toward a theory of agricultural insurance. American Agricultural Economics. 3: 523-531. Available at www.jstor.org/stable/1241688 (Last access: 12 January 2011). Sadati S. A., Rostami Ghobadi F., Mohamadi Y., Sharifi O. and Asakereh A (2010) Survey of effective factors on adoption of crop insurance among farmers: A case study of Behbahan County. African Agricultural Research. 16: 2237-2242. Available at www. academicjournals.org/AJAR (Last access: 12 January 2011). Smith V. and Baquet A. E (1996) The demand for multiple peril crop insurance: Evidence from montana wheat farms. American Agricultural Economics. 1: 189-201. Vandeveer M. L (2001) Demand for area crop insurance among litchi producers in Northern Vietnam. Agricultural Economics. 26:173–184. Available at www.elsevier.com/locate/agecon (Last access: 10 January 2011).